As we are getting Phoenix project under way, I am trying to get it started right by introducing more XP practices. The first three things that we are trying to do are Paired-Programming, Test-Driven Development, Continuous Integration. This blog, is about Continuous Integration. Actually, Guidewire has already built an internal tool, ToolsHarness, to handle continuous integration, as I have written in “Managing Tests with ToolsHarness, Individually“. The only difference that I want to introduce for Phoenix project is to fix broken tests AS SOON AS POSSIBLE. What this means is that I want the testing status of our branch to show right in out faces, without us having to launch a browser, so that we know to take action the moment a test is broken. I talked to the developer who manages ToolsHarness, and he wrote a servlet that serves information about broken tests and test status like this picture, except in one HTTP GET. Then I set up CruiseControl(version 2.8.2) with X10 publisher, following the setup described on this blog post “Bubble, Bubble, Build’s In Trouble“. 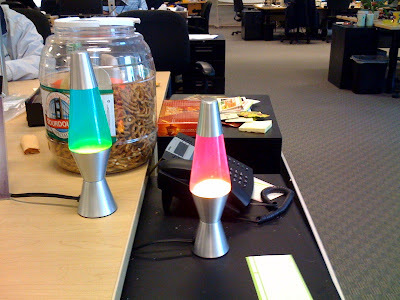 One thing about the normal lava lamp setup has always bugged me in the past, which is when the continuous integration server is in the “testing” state. 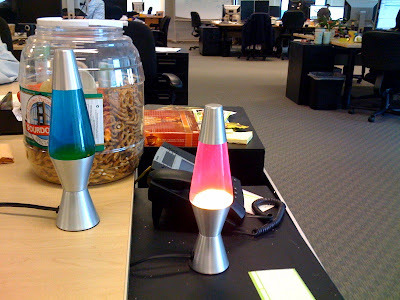 When you have test broken, the red lava lamp will be on, and you just have to remind yourself that the fix is in and test is running. In some projects, I have used “project soundscape“, so that when tests finishe but are still broken, you will know about it. But if you happen to step outside, you will miss it. Or if you just came in, you have to check the browser or ask others. “houseCode” and “deviceCode” are for X10 module configuration. “port”, with the value of COM1, COM2, etc., to match the place you plugin the COM module. The last one is “interfaceModel”, which you should really double check with the COM module that you have. In the end, I would like to say that I am a satisfied ci-guys customer! The idea of “Enterprise Agile Testing” has been in my head for several months now, result of what I have learned at Guidewire and based on my previous XP experience at ThoughtWorks. I am planning on a proposal to Agile 2008 on this topic. Before I can choose my proposal topic, I need to write everything down first, kind of like a project engagement. Actually, project engagement is not a bad analogy. I must define what my proposal is about and what it not about — what is out of scope if you will. My approach is to write a series of blog posts, each cover a specific topic and look back to see what I end up with when I am done. If I approach it as if I like writing a book or even like that agile 2007 paper, I might never finish it. Enterprise here means large scale software development. The large scale can come about through a large code base or a large team. Here I am ignoring the controversial topic of whether or not large code base or large team are problems that should be avoided in the first place. They exist, I just want to point out two things that result from them with regarding testing in such an environment. First, with a large code base, a tester cannot clearly hold onto the code’s design in his or her head, let alone the intention of the test. Instead, agile testing in enterprise environments requires a comprehensive testing framework. This framework must do more than what JUnit does out-of-the box, so that anyone (including you) can come back to a test at any time and understand it. Second, with large team, it is pretty much impossible to ensure everyone is aware of how important testing is. This is not to say that you should give up on a large team’s continuous improvement on treating testing seriously and writing better tests, but I have found out that the line of “Zero Test breakage” is extremely hard to hold. As a result, some middle ground must be reached between complete awareness and total ignorance. Only in this way is it possible to see results in testing improvement efforts. Since Rob and Jim pulled me away from the EJB madness and introduced me to the wonderful world of XP in 2001, “Enterprise” has slowly restored its place in my vocabulary. At the same time, the term “Agile” is getting closer and closer to my list of red flag words. Agile here refers to the situation where the code is constantly under changes. This can happen because the requirements keep changing, or the development is done iteratively through story driven development. Constant change makes the ability to write concise tests more important. Additionally, the tests status of project must be treated as more than a binary state if testing is to keep pace with development. In this way, the development would not be paralyzed because there will almost always a test broken here and there, and the turn-around time for testing the checked-in code is not as short as 10 minutes. So you have a large project code base that you keep changing, with a team of members with mixed skills. You need to ensure that the code (including the tests) you write is of high enough quality so that two moths from now you can still read them, understand what they do, understand why they do that, and change them. At the same time, you want to give others the time and tools to adjust to test infected development and hopefully test-driven development eventually. So, the above is the introduction. The items that are in my mind are as following, I’ll update the links as I post them.